Home › Personal (not econ) › sarcasm › Sarcasm Marks? ¡¿We Don’t Do No Stinking Sarcasm! Sarcasm Marks? ¡¿We Don’t Do No Stinking Sarcasm! [Updated… see below] We only have two official punctuation marks that express nuance, the exclamation point for emphasis and the question mark for questions. This makes writing flat and inexpressive and has spawned the use of emoticons;-) Writing limits our ability to express the nuance that verbal intonation and facial expressions communicate. This limitation is particularly evident in the expression of sarcasm. Fortunately, there are international symbols that are built-in to every computer’s existing capabilities that fit the need perfectly because they intuitively communicate the desired meaning. These symbols are used in Spanish, and they are readily available for English writers to appropriate for our own needs. They are the inverted exclamation and question marks (¡¿) and they should be used at the beginning of a sarcastic sentence. Because English sentences are structured differently for questions than for statements, writers do not need to put a question mark at the beginning of a question like Spanish writers do. To ask a question in Spanish, speakers simply raise their voice at the end of a sentence to mark it as a question and there need not be any difference in the sentence structure. This makes it important for Spanish writers to put the question mark at the beginning of their sentences as well as at the ends. Sarcasm is similar. You need to infuse an entire sentence with nuanced intonation to denote sarcasm. Therefore, a sarcasm mark needs to go at the beginning of the sentence to be effective just like the question mark needs to go at the beginning in Spanish. Sarcastic sentences could end with regular punctuation to further signify the nature of the sarcasm. Most sarcastic sentences should end with an exclamation point, but dry sarcasm should end with a period and sarcastic (often rhetorical) questions should end with a question mark. In everyday conversation, sarcasm is sometimes revealed after a statement is spoken by showing a wry smile, a raised eyebrow, or a wink. But this is often because a listener didn’t understand the intended sarcasm and the additional gesture is needed to correct the misunderstanding. Sarcastic writing will usually flow better if the sarcasm is revealed at the beginning of each sentence because will need to think of a different nuance and intonation for sarcastic sentences than for serious sentences. The end of the sarcastic section should be denoted by a single upside-down punctuation mark. Use an upside-down question mark for a sarcastic question and and upside-down explanation mark for any other sentence. In those cases where the writer wants to reveal the sarcasm at the end of the sentence, it is fine to use bracketed upside down marks at the end. Such as to say, “This sentence is soooo sarcastic[¡¿]” You can also put sarcasm marks in the middle of a sentence in brackets to denote the beginning of a sarcastic clause. I also use sarcasm marks in brackets within someone else’s quotation (example here) to emphasize that their quotation is ridiculous. The SarcMark® is a registered trademark. Punctuation should be based on open standards. It is difficult to use because it is completely new. It does not exist among existing keyboard letters. You have to purchase patented software to be able to use it! The section entitled, “How to Use the SarcMark®” says to put it at the end of a sentence, not the beginning. This makes the sentence’s meaning ambiguous until the end and it limits the ability to indicate if the sentence is dry sarcasm (end with a period), or more biting (end with an upside-down exclamation point), or a question (end with an upside-down question mark). Although it is part of unicode (U+2E2E), it is mostly ignored, so most applications don’t include it. For example, the WordPress system I am currently using for this website does not include it in the standard set of symbols even though WordPress has an extensive set of other obscure symbols including symbols like ♣,ζ,¤,‰, & ◊. The irony mark is so obscure, it doesn’t even display correctly on many of the Wikipedia pages that write about it! And Wikipedia is built to communicate in almost every written language, so if Wikipedia doesn’t display it correctly, it must be hard to display. Dyslexics don’t get it. They can correctly perceive when a character is upside down, but have a hard time perceiving flipped left-right mirror images. The symbol already has prior alternative meanings. It was originally invented by Henry Denham in the 1580s, but he called it the Percontation Point and used it to signify a rhetorical question. The same symbol is also used in Arabic to signify a regular question. So the irony mark is already has a history of use for a completely different meanings. It uses excessive characters. Why use three characters when two characters can be even more expressive? Sarcasm marks need to be at the beginning of a sentence rather than at the end, at least for English speakers. It might be fine to put it at the end for deaf people. I don’t know how deaf people communicate sarcasm in sign language, but I would guess that they also infuse entire sentences with irony rather than waiting until afterwards to reveal the twist. Less intuitive. The metaphorical advantage of upside-down symbols is that it indicates that the meaning is somehow upside down too. Bracketed exclamation marks are already used for a different meaning. For example, it is often used within quotations of other people’s words to ridicule something that is being said. Karl Marx often used bracketed exclamation marks. I sometimes do this with upside-down marks for extra kick. 4. Scare quotes are sometimes used to express irony or sarcasm. Sarcasm marks belong at the beginning of a sarcastic sentence, not at the end. The reader needs to begin reading a sentence with a sense of how to intone the vocalization of the sentence from the start. Questions can be sarcastic too and so we need to keep space at the end of sarcastic sentences for regular question marks. The uptalking intonation of a question only comes at the end of a sentence and so that is the natural place to put a question mark. But sarcasm is different. It is a subtle attitude that is usually infused in the intonation of a sentence from its beginning. Unfortunately the temherte slaq looks very similar to a lowercase I as you can see here: i¡. In some typefaces it is identical to an i. ‘I’ is already an extremely common word in English and so it can be ambiguous as to whether the symbol is a badly capitalized I in English. The punctuation is less ambiguous in Ethiopia which does not use i as a word. ¡¿That temherte slaq doesn’t look confusing… Not! Ok, ok, so I also use the upside down exclamation point at the end of sentences, but I precede it with a “¡¿” so that the reader is prepared by having to context to see that it isn’t just a semicolon, and the temherte slaq is not the same as an inverted exclamation point. The temherte slaq looks a lot more like a semicolon than what I use. 6. The interrobang. This symbol is primarily used the same way as “! ?” and this is different from sarcasm. An inverted interrobang at the beginning of a sarcastic sentence would work just as well as my proposal, but it is not universally available under current typographic standards. 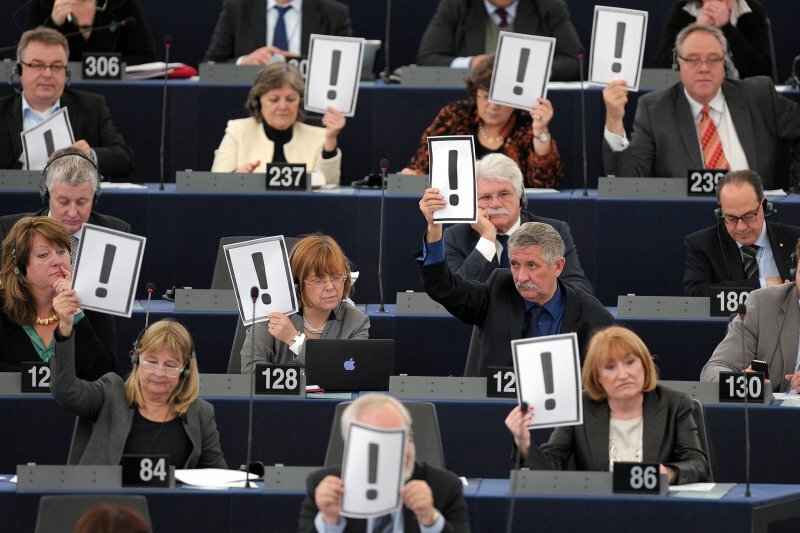 Inverted question and exclamation marks are supported by most international standards that are common to nearly every modern computer, including ISO-8859-1, Unicode, and HTML . 7. Emoticons like “:P”, pseudo-HTML such as, “</sarcasm>", and the Twitter hashtag, “#sarcasm” are also used to denote sarcasm. Emoticons are too ambiguous and the other alternatives are too many characters in length and look a bit like cartoon profanity: #<!%*”>?. ¡¿Why not just use “#<I’m being sarcastic now, ok>”?¿ Ugh. ¡¿Sarcasm can never be overused¡ I have nothing more to say. Update: Economists need sarcasm more than most professions due to the depressing absurdities that we constantly have to deal with. For example, Paul Krugman’s blog would be much clearer with better punctuation. Sartalics is a system with similar advantages to sarcastises. It seems to be intended for Twitter which currently uses emoticons and “#sarcasm”. The Card Chronicle uses a tilde (~) at the end of a sentence for sarcasm. Shady Characters has the most exhaustive work about punctuation and particularly the punctuation of irony, and the author has even written a book on the subject. Brain Pickings gave a comprehensive summary of the irony section of the book. The easiest way to start using sarcasm punctuation in your own writing is to simply select the characters here–¡¿–then copy and paste them into your writing. All computers can already create the characters and several websites tell how.